I was supposed to write this post in January, but time has sped away from me as usual, but in some ways that's a good thing, because this is the time of year when people's new year resolutions start to be forgotten and motivation dwindles. Before I was a mum I would take various supplements religiously, including Omega 3, Cod Liver Oil and multi vitamins, but these days I would be lucky to remember to even buy them! 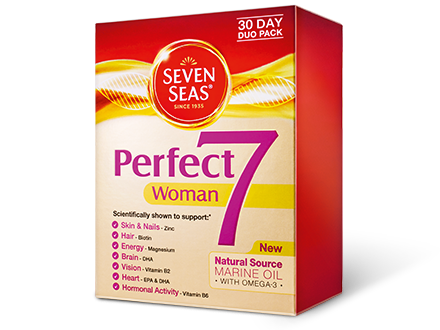 To attempt to change this I have been trying Seven Seas Perfect 7. It's for people who are getting the first signs of (ahem) ageing and now I have recently turned 30 this is definitely my category. They include Omega 3, key vitamins and minerals and have been created to give seven key benefits, including addressing the internal signs of ageing, helping the heart and my favourite: reducing tiredness. I've only been taking them for a few days so hard to tell if they are helping or not, but taking just one tablet means I can fit it in whilst rushing around making breakfast for Chunk and the guinea pigs. Yes this is still one that I'm not quite achieving, unless you count running up the road after Chunk when he decides not to listen to me, which thankfully is a lot less now that he's getting older. I have bought a few new fitness DVDs including ones that are good to do when you have a bad lower back like I do, but they are still sitting on the shelf gathering dust. However, I have started to plan out time slots that I can do these of an evening, as well as the work I have to do (the joys of self employment with a toddler) so it really is a case for me to just get on with it. But I do also have to remember that time to just sit about and recharge my batteries is something I should try to fit in, as all parents need this! Mindfullness is something I have dabbled in now and again, but due to the complicated nature of it and it's practice I have not been too successful at the moment. So I am starting to look at NLP again (neuro-linguistic programming) which is something that has been of great help to me over the years when I have wanted to change my mindset to become more positive. 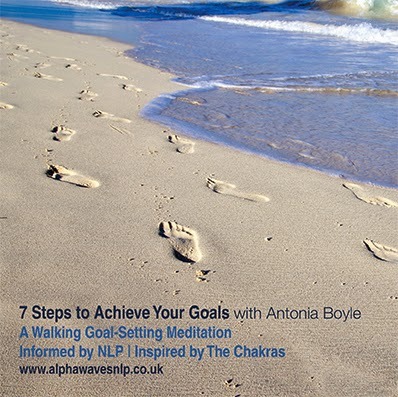 The latest one I am trying at is a 26 minute audio NLP meditation called 7 Steps to Achieve Your Goals. This is perfect because it's for people who have repeatedly tried to achieve their goals but have failed. It was created by Antonia Boyle, a NLP Master Practitioner, health, yoga and relaxation expert and it includes techniques to help encourage positive change. I'm giving two readers the chance to win this meditation recording, so if you are sitting there thinking it could be of some help to you, just click here to enter! I was given the Perfect 7 vitamins and an audio copy of 7 Steps to Achieve Your Goals for the purpose of review. No payment was received and all opinions are honest and my own. I've never heard of neuro-linguistic programming but it sounds interesting. Think I will have to do some research. One of mine was to eat more fruit but I haven't been very successful so far. I am trying so hard to stick to my resolutions, how are yours going?